Bananagrams, the letter-tile game that is similar to Scrabble, is the better game in my opinion because of its fast pace. Players don't need to wait for their turns to come around. They just keep playing until they run out of tiles. Games go in and out of favor in my family, so Bananagrams had been gathering dust recently. But then a few days ago, my ten-year-old brought the Banagrams for Kids book home. It has fun word puzzles at several levels of difficulty. This book, along with the tiles, has become our pre-bedtime play for the past few days. We are not about to quit. I like that it naturally teaches vocabulary, spelling and chunking skills with letters and words--all through play. The game-and-book set would make a great Christmas gift if you want to make learning fun for your kids. If you have the letter tiles, you don't need to write in the book. What kind of word games do you play with your children or students? Share in the comments! Are you the parent or teacher of a child who struggles with word choice in speaking or writing? Wouldn't it be great for that child to learn the parts of speech while playing a fun game? 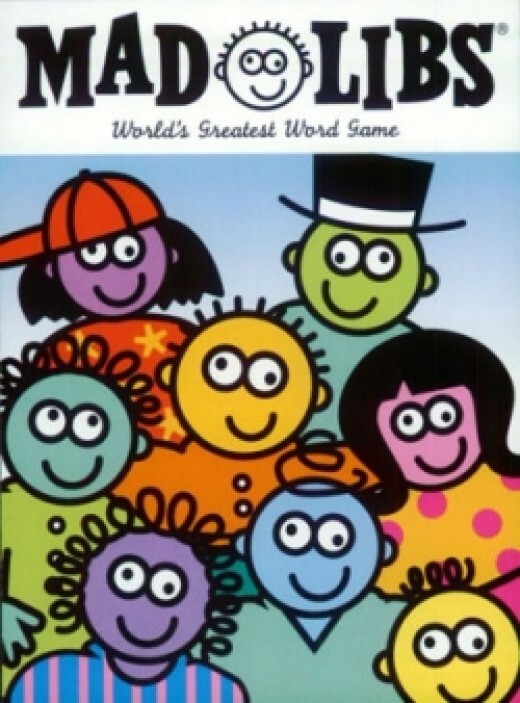 Mad Libs, a perennial party favorite, is an ideal way to teach the parts of speech. Motivated to make a silly story, students don't really realize that they are memorizing grammar definitions. A word not sounding right in the story is a gentle way for a child to recognize and correct a mistake without help from a parent or teacher. Besides the original booklets, there are now online versions, printables, DVDs and even iPhone apps. Read on for teaching tips and links. Don't pre-teach too much. Students will pay better attention to your explanations when they need the information you are giving to progress through the game. Students should be the ones to write the words that they come up with (think spelling practice). They obviously can't write directly on the story, so use a blackboard/whiteboard to record words, or prepare a separate paper for students to write on. Pick stories that are interesting to the students, or alter stories to include elements, like familiar names and cultural references, that they will enjoy. After reading the mad-libbed version of a story, go back and have students choose words that would actually make sense in the story. This helps with reading comprehension skills like predicting and making use of context. Have students write their own mad lib stories, and then work with a partner to fill in the blanks. Offer to help the students submit their stories to online mad libs sites. Who doesn't want to be a published writer? Since you're online now, the best place to start finding mad libs is right here on the web. Check out the links below. Some feature printable mad libs. Others can be played online. Many sites offer both options. Why would you want to buy Mad Libs books when there are so many free stories online? There are a few reasons. First, all of the official mad libs stories make it across an editor's desk before being published. The quality of the writing is better than much of what you'll find online. Second, there is probably a themed Mad Libs book that will suit your child's interests perfectly. And third, it's just easier to throw a Mad Libs book into a backpack or the glove box than to find and print out copies to take on the road. one size of Kapla block, 120 mm by 24 m by 8 mm (about 4 3/4 inches long). At first, a box of 200 identical blocks looked too simple to be much fun, but after getting addicted I realized that the simplicity is what's great about them. Toddlers can stack them one on top of another. Older kids can build simple structures. Serious hobbyists have built structures over 50 feet tall. You can put them together in endless combinations, and they are precision-cut so you can build really tall without them getting wobbly. 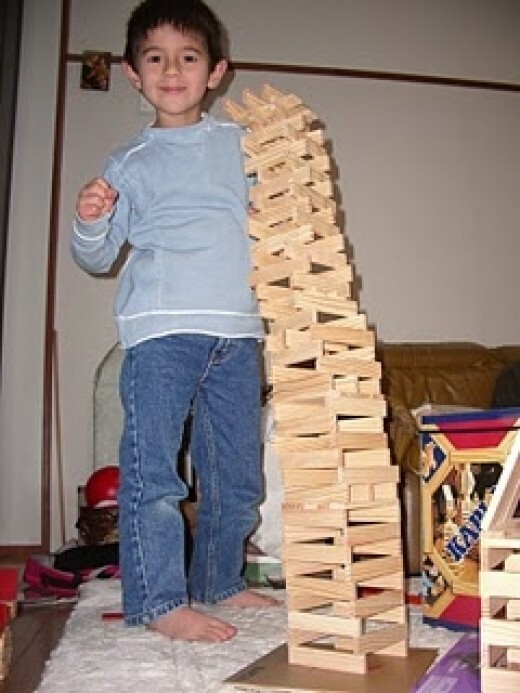 The tower in this photo was built by my son (then age six). My daughter (then age four) built the structure that you can just see in the right foreground. Our youngest son (now age three) has been playing with Kapla blocks practically since he was born. Kapla, Keva, Citiblocs -- What's the difference? 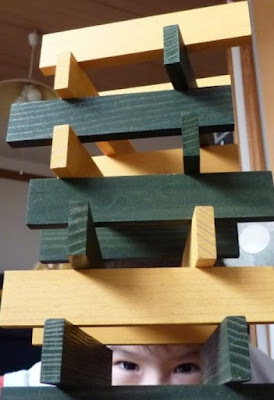 On this page I discuss Kapla Blocks because they are the original and still the most popular, but Keva Blocks and Citiblocs are virtually the same product from different manufacturers. The three brands of blocks are exactly the same size and manufactured to similarly high standards. All three are made of pine. All three kinds can be mixed and matched without a problem. We have Kapla blocks at my home and Citiblocs at the preschool where I work. The Kapla blocks seem to get less dinged up, but that may just be because the Citiblocs get heavier use. Keva are the cheapest as of this writing, but please see below for current prices on Amazon for a set of 200 blocks, which I think is the bare minimum. We've added more sets to our original starter set. Different sets have different kinds of storage containers; the Kapla ones are quite nice. Some sets come with idea books too. You can click through the product picture to see the various sets. Amazingly Versatile Kapla Blocks -- Even better than Lego? I used to think Lego/Duplo was the ultimate in amazingly versatile building blocks, but I've changed my mind. Kapla planks can be placed in any dimension (there's no up, down or sideways) and they don't interlock, so pieces can be placed at any angle. They are lightweight, virtually unbreakable, and too big for a baby to swallow so they're safe in a house or day-care center with children of various ages. My sixteen-year-old son enjoys them as much as the three-year-olds at my preschool. These blocks are well made and could last for generations. Youngest son peeking through a tower. After you get your starter kit, you might want to add color. Leave your ideas or questions in the comments below. I'll try to answer any questions you have. Looking for fun ways to learn hiragana? You'll see how kids in Japan learn to read through games, posters, cards, apps, and more. Japanese is a notoriously difficult language to master, but learning to read hiragana, the basic syllabic script can be easy and can be fun! Each character's name is simply the sound it makes every time with a few minor exceptions. Learn the 46 characters and you'll be able to read many signs, labels, and even children's books. Vocabulary acquisition will be much easier, not to mention finding your way around in Japan. Resources for learning hiragana abound, but how do Japanese children learn to read so quickly and at such a young age?? Read on to find out how you or your students can learn hiragana naturally, like a Japanese kid. Learn one or two hiragana every day. Any time I visit the home of Japanese friends who have kids, I never fail to see a hiragana, katakana, or kanji chart in the bathroom. Get one of these, stick it up on your wall, and in just a minute or two per day, you'll see your hiragana recognition improve. They are all over the place in Japan, but a bit hard to find overseas. Here is the best free, printable hiragana chart I have found online. 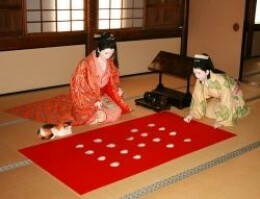 Even before children learn how to read, you sometimes hear them playing shiritori. Shiritori is a fun Japanese word game played by children and adults that helps with vocabulary and the Japanese concept that the building blocks of words are syllables, not vowels and consonants. Shiritori literally mean "take the bottom" (Japanese is traditionally written from top to bottom) and is played by taking the last syllable of a word and using it as the first syllable of the next word. Players take turns doing orally this until someone says a word that ends with the syllable "n" because no Japanese words begin with that sound. Unfortunately, The image here is a complete (albeit short) shiritori game. In case you can’t read hiragana yet, I’ll explain using romaji (the latin alphabet). Reading from top to bottom, left to right, we have onigiri (riceball), riyuu (reason), untensya (driver), yamasyatsu (mountain shirt), and tsuushin (communication). The "n" at the end of tsuushin ends the game because no Japanese words start with that kana. Rules are flexible, but generally only nouns are accepted and once a word has been used, no one can use it again. See Shiritori on Wikipedia for variations. Japanese kIds love the memory game (sometimes called concentration) and regularly beat me at it. To play the hiragana memory game, make two copies of these printable hiragana flashcards onto some sturdy paper and you're off. 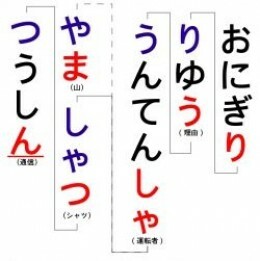 Or you can play an online hiragana memory game at easyjapanese.org. These blocks are just like the ones we learned our ABCs with, but they're hiragana instead! I haven't used them myself, but they have five stars from all the verified purchasers on Amazon as of this writing. If you've spent time in a Japanese school, you've seen these faces on blackboards. It's name, henohenomoheji, comes from the hiragana characters that are used to draw it. I've seen this many, many times, but never on an unerasable surface. Japanese kids are polite that way with their graffiti. Japanese Hiragana & Katakana for Beginners is a well-reviewed, systematic approach to learning the kana. There are lots of appealing activities to keep the learning fun. 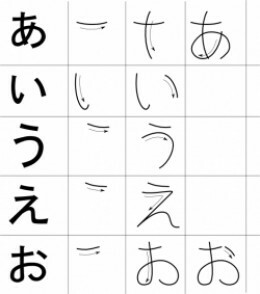 Any questions, comments, or other ideas about how to learn hiragana? Remember, our goal here is to Make Learning Fun! The Sugar Creek Gang series of 36 books follows the adventures of Bill Collins, Poetry, Dragonfly, Big Jim and the rest of the gang as they fish, solve mysteries, get into fights, make up, and generally try to do what's right. These page-turners, written between 1940 and 1970, build faith and inspire boys as much today as they did when first published. The kindle versions are less than two bucks apiece when you buy the six-packs from Amazon. Dave and Neta Jackson are the authors of the Trailblazer Books, a series of 40 historical fiction adventure books in which young protagonists interact with heroes of the faith like David Livingstone, William Tyndale, and John Bunyan. Roundup of the Street Rovers with an orphan named Kip as protagonist, chronicles the lives of street kids in New York at the turn of the last century and how Rev. Charles Brace started the Children's Aid Society of New York and the orphan trains that took street children from New York to be adopted by families in the Midwest. My son has read most of the series and named this one as his favorite after much deliberation. C. S. Lewis's Chronicles of Narnia are my son's favorite books (mine too actually). Any boy who hasn't yet met Peter, Edmund, Eustuce, Caspian, Shasta, Aslan, Tumnus, Reepicheep, and Puddleglum are in for a treat! These books can be read and enjoyed at many different levels, and at every stage in life. T's favorite is Prince Caspian, and mine, for the moment, is The Silver Chair. Good Night, Gorilla is, without a doubt, the most requested readaloud at my preschool. Besides "good night," there are only ten other words in the book, but that belies the richness of the conversations and the possibilities for learning that the book provides. Every time I read this with the children, they discover something new, and new questions arise. Among the many wonderful surprises in Good Night, Gorilla are the pictorial nods to other standards of early childhood like Curious George, Babar, and Sesame Street. "Good Night, Gorilla" could be the first book your child "reads"
The pictures in this book are bright and simple, yet extremely detailed on a closer look. Children want to see it over and over. Because they see it so many times and the few words are either repeated over and over ("good night") or have strong visual cues (names of animals), before long children as young as two or three can "read" this book. 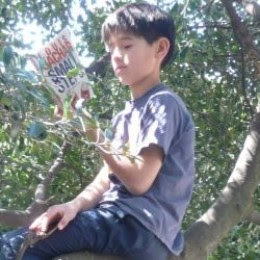 Being able to read a whole book instills confidence and an appetite for reading. 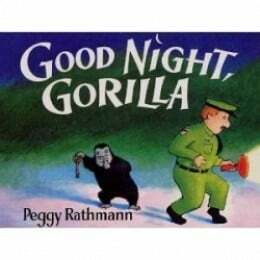 There are tons of projects, lesson plans, and activities that relate to Good Night, Gorilla. I've curated some of the best ideas from the web to help you get the creative juices flowing. First-school.ws provides ideas for several activities such as sequencing and vocabulary work, dramatic play, and a snack (ants on a banana bus). Particularly valuable are the printable Good Night, Gorilla finger puppets in color or black and white. This is a pdf with several guided conversation ideas and a big list of vocabulary words that you may want to introduce or practice. Please leave a comment with your "Good Night, Gorilla" ideas.